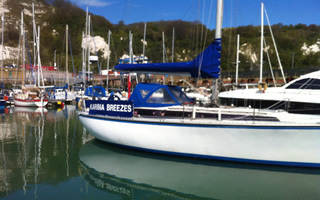 Our covers are manufactured in acrylic canvas for Sprayhoods, sail covers and spray dodgers. 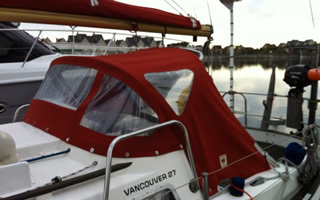 For winter covers and larger heavy duty boat covers Topgun a durable polyester fabric is used. Spray hoods and cockpit enclosures, have stainless steel frames bent specifically to suit the yacht. These are in 316 stainless usually 16 gauge for rigidity. We use 3/4,7/8 and 1 inch for larger constructions. The frames can be jointed for ease of stowing. The frames are set up to the desired shape and patterned over, to produce a polythene duplicate of what is required. This means that you can see the hood and or enclosure before it’s made up in the fabric and make sure that windows and doors etc are where they are best suited for your use on board. We then return to the boat to install the covers, to align fasteners and correctly tension the hood. Winter covers are usually made to measure, fitted once for rig slots, mooring line access, doors and areas of chafe reinforced. We return to install finally ensuring the boats well wrapped up for the winter. Sail covers and dodgers are made out of a breathable acrylic canvas, allowing the sail to breathe when under cover. Coated fabrics are not used for this application as they can encourage mildew and rub off. Coated fabrics are only used where maximum water resistance is required. Please remember that we also valet and reproof all types of covers as part of our valeting service. Regular valeting will ensure your covers are checked and prepared for the coming seasons giving you the maximum life out of your investment. All our covers carry a three year guarantee against failure in materials and workmanship.